Quite often, Gulf Winds Track Club's Palace Saloon 5K has been an epic road race. The winners have been a big part of that epic. Here are some pictures of the overall winners, men and women, for the years 2007 to 2018. That's a dozen years and two dozen winners--four six-packs of champions. I was directing or co-directing the race in some of the earlier years, so I am going to use that as an excuse for the weaker photography back then. The later years? That's all on me. 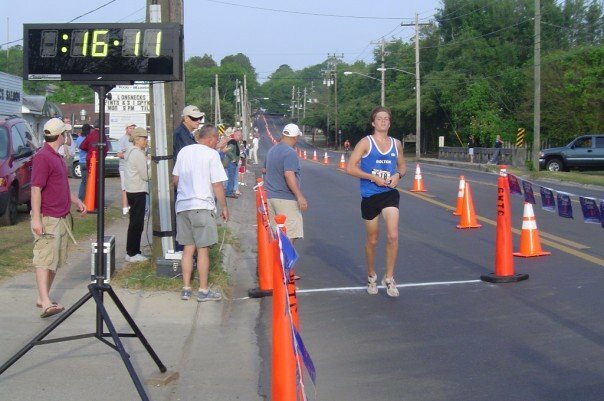 J. P. Cook was the first of 537 finishers at Gulf Winds Track Club's 2007 Palace Saloon 5K. One of many Florida State University trackmen to race the Palace over the years, Cook cruised to a 16:12 win on Jackson Bluff Road. Tripp Southerland was a distant second in 16:39. 2007 was the last year that Breeda Dennehy-Willis would run the Palace Saloon 5K. She went out a winner, running 17:14 and collecting her third Palace title. It wasn't the Irish Olympian's best time on the course; that would be the 16:31 she ran in 2005. Lara Shaw was second in 17:55, and a Tallahassee schoolteacher named Lisa Johnson was third in 19:06. Nick Sunseri's final track season at Florida State University was still a year off in 2008 when he found time to race the 32nd annual Palace Saloon 5K. Sunseri outraced Chris Lake for the win that morning, 15:40 to 15:45. 782 runners crossed the finish line. The Palace was not only getting bigger; it was also getting faster. Lisa Johnson and Lara Shaw were back at the Palace in 2008 after finishing behind Breeda Dennehy-Willis in the 2007 race. 2008 was a fight all the way to the finish line, with both Johnson and Shaw clocked in 18:46. But Johnson got their first and had her first Palace Saloon 5K win. 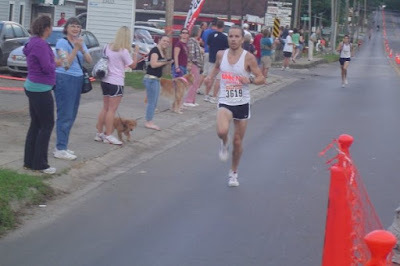 Was 2009 the first time that the Palace Saloon 5K had over a thousand finishers? It was certainly the first time that many had been documented as crossing the finish line. John Robida was the fastest in that field of 1,022 runners, winning the 35th annual race in 16:21. Two weeks earlier, David Altmaier had finished ahead of him at the Springtime 10K, winning that race, but at the Palace Altmaier was runner-up in 16:28, just ahead of third-place runner Stephen Cox at 16:30. Coming off a win in the Springtime 10K, Lisa Johnson won her second straight Palace Saloon title, beating out runner-up Amy Hines 18:11 to 18:15. Johnson and Hines were eighteenth and nineteenth overall in the field of 1,022 finishers. A record field of 1,214 finishers arrived at the Palace in 2010. The first athlete there was Chris Lake, who won the 36th annual Palace Saloon 5K in 15:45, a comfortable 21 seconds ahead of runner-up Daniel Lee. A Florida State University student and an alumnus of the Chiles High cross-country team, it was Lake's first win at the Palace. There would be more. The evening before the 2010 Palace Saloon 5K, Christina Woytalewicz was on Florida State University's Mike Long Track, running a 10:29.20 in the women's 3,000-meter race at the Seminole Twilight Meet. That would have been a full weekend for most athletes. But Woytalewicz, a member of the FSU track team, got up the next morning and raced the Palace. She took the women's title, outrunning Amy Hines 17:42 to 17:45. Defending women's champ Lisa Johnson was the fourth female finisher, 29th overall in 18:32. In 2011 the starting line of the 37th annual Palace Saloon 5K had to be moved to Tallahassee Community College because of an event at Messer Park. Before dawn on the morning of the race, there were intense thunder storms and a tornado watch in the Tallahassee area. But the weather cleared, and over a thousand athletes made it to the race. Defending champ Chris Lake was among them, and he successfully defended his 2010 title, running 15:48 and finishing nine seconds ahead of runner-up Marc Akbar. Lisa Johnson was at the Palace Saloon 5K in 2011, looking for a third women's title in the race. But Lindsay Zeiler was also there. A former Southeast Missouri Redhawk distance runner, Zeiler was the first Palace woman in 2011, running 18:24 on wet streets and placing 24th overall. Johnson was second in the women's standings, placing 29th overall in 18:43. For the 38th annual Palace Saloon 5K the starting line returned to Messer Park and Dupree Street. The beautiful spring weather had returned as well. And Stephen Cox was back. Cox was leading with 800 meters to go, when the race crested the hill on Jackson Bluff Road. But on the downhill drive to the finish line, Josh Myers moved from third to first, passing Cox and winning the race in 16:07. Cox was runner-up in 16:09, followed by Peter Wood (16:15), Charlie Johnson (16:15), and Christian Minor (16:16). 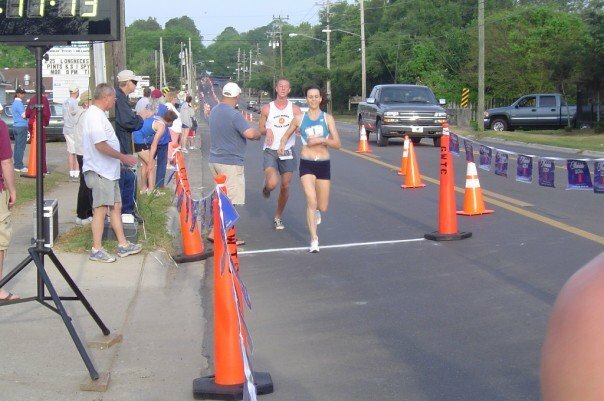 Lindsay Zeiler successfully defended her 2011 title at the 2012 Palace Saloon 5K with a fast 17:20. Amy Hines kept it close for the first half of the race but fell behind after that, taking second in 17:41. 2008 and 2009 Palace winner Lisa Johnson was third on the women's side at 18:17. Mike Burns took over race director duties for the Palace Saloon 5K in 2013. He immediately put his mark on the race, subtly improving the course by moving the starting line from Dupree Street onto Jackson Bluff Road. Instead of a counter-clockwise circuit of Messer Park, the race now started with a clockwise lap. But the race still finished on Jackson Bluff Road at the Palace Saloon, and the first one there was Stan Linton. A freshman at Florida State University, an alumnus of the Wakulla High cross-country, and a Navy ROTC midshipman, Linton led nearly the whole way, but not by much. Peter Wood and Will Stanford were right behind him the whole way, and less than three seconds separated the trio at the finish line. Linton was first in 15:46, Wood second in 15:49, and Stanford third also in 15:49. 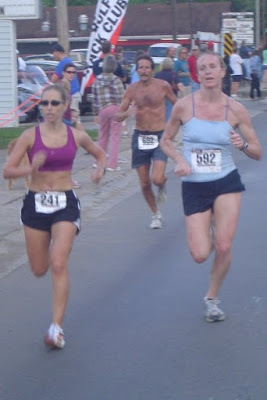 Sheryl Rosen had first run the Palace Saloon 5K in 2006, collecting quite a few top ten finishes. 2013 was the largest Palace yet, with 1,389 finishers. That was where Rosen nabbed her first Palace women's title, running the 39th annual race in 17:49. At 18:07, Dr. Katie Sherron was the women's runner-up. 2014 was a landmark in Palace Saloon 5K history, the 40th annual race. It was also the year that two-time champion Chris Lake returned to the Palace following absences in 2012 and 2013. Lake shook off most of the competition by surging just after the mile mark, but Zach DeVeau stayed with him till the final downhill. There, Lake made a decisive move, racing to the Palace in a winning 15:49. It was Lake's third Palace title. DeVeau was runner-up in 16:12. Amy Hines had been the women's runner-up at Palace in 2009, 2010, and 2012. 2014 was her year. Leading nearly from wire to wire, Hines ran 17:45 for the women's title. Dr. Katie Sherron edged Lisa Johnson for second in the women's standings, 18:42 to 18:47. 2015 was the third year in a row that there were over 1,300 finishers at the Palace Saloon 5K. It was also the third year in a row that the winning time was under 16:00. It was 15:29, and Tyler Udland ran it. The Palace is often a close race, resembling a track event more than a road run, but Udland, a graduate student in finance at Florida State, won by 50 seconds. Several runners stayed with him for the first half of the race, but Udland buried the field during the second half. There was quite a race for runner-up, with Stephen Robbins taking second in 16:19, three-time champion Chris Lake third in 16:22, and Nate Kaiser fourth in 16:24. Lauren Poulos ran with the 2013 women's champion, Sheryl Rosen, for the first half of the 2015 Palace Saloon 5K. Then Poulos ran away from Rosen. A former Florida State University distance runner, Poulos won the women's title in 17:54, with Rosen second in 18:24. Leading the 2016 Palace Saloon 5K, Matt Mizereck took a group of six runners through the two-mile mark in 10:24. That's when Nick Merrett of New Zealand decided to make his move. A University of West Florida Argonaut cross-country runner, Merrett surged away from the field. University of North Florida alum Chris Haynes was narrowing the gap on the final downhill, but Merrett was across the finish line first in 15:53. Haynes took second in 15:56, with early leader Mizereck third in 16:15. You wouldn't have picked an eleven-year-old girl to take first in the women's division at the 2016 Palace Saloon 5K, but Ani Veltcheva was no ordinary eleven-year-old girl. At age nine, Veltcheva had set a single-age world record for the girls' 5K, running 18:47. Two years later she was even faster. Emma Reed led the women's field for the first two kilometers of the Palace, then Ani took over during the third kilometer. The last two kilometers and the race belonged to Ani, as she arrived at the Palace in a winning 18:13. Reed was second for the women in 18:25, and Adriana Piekarewicz was third in 18:54. After winning the 2013 Palace, Stan Linton had made both the track and cross-country teams at Florida State University as a walk-on. In 2017 he still had some NCAA eligibility remaining, but found a walk to run the 43rd annual Palace Saloon 5K. Linton took off from the very start of the race, fueled by visions of establishing a new Palace record. He didn't, but he did win the race in 15:16. Chris Haynes and Florida State graduate student Matt McCurdy spent the whole race watching Linton get farther ahead. Haynes ended up second in 15:43 and McCurdy third in 16:36. In 2017 Ani Veltcheva came back to the Palace from her hometown of Gainesville, Florida to defend her 2016 title. 2015 champ Lauren Poulos was also in the field, as was 2013 champ Sheryl Rosen, but Veltcheva grabbed the lead almost immediately. Late in the race, Adriana Piekarewicz narrowed the gap a bit, but Veltcheva was too far ahead to be caught. Veltcheva won her second-straight Palace Saloon 5K in 17:58, with Piekarewicz second in 18:15. Dr. Katie Sherron was third in 18:31, and Rosen fourth in 19:12. Chris Haynes had finished runner-up at the Palace Saloon 5K in both 2016 and 2017. By 2018 he was ready to go for the top spot, taking the lead 400 meters into the race. But Haynes couldn't get away from Justin Garrard. Garrard stuck to Haynes through most of the race, overtook right before the crest of Michelob Ridge, then cemented his win on the downhill dash to Budweiser Creek. Garrard's winning time of 15:15 was the fastest at the Palace since 1994, when Robin Rogers ran 14:56. Haynes took second in 15:21, while Andrew Smith was third in 15:52. With middle school track, swimming, and competitions in math and science, Ani Veltcheva hadn't had much time for 5K road races. But Veltcheva made time for the 2018 Palace Saloon 5K. The two-time winner took the lead early, trailed by Ann Centner and Dr. Katie Sherron. Sherron broke away from Centner during the second half of the race to try to chase down Veltcheva, but the youngster's lead proved insurmountable. Veltcheva ran 18:05 to take first in the women's standings, her third straight Palace win. Other athletes have won the Palace three times, but not before they entered high school. Sherron was second in 18:17 and Centner third in 18:28. 2013 winner Sheryl Rosen went 18:45 for fourth, and 2015 winner Lauren Poulos took fifth in 19:30.